Danny Spewak (@dspewak) is a Big 12 microsite writer. He’s in Kansas City this weekend for the Big 12 Tournament. Budding Rivalry: Kansas needed a rival when Missouri bolted to the SEC. Most figured it’d be Kansas State — and it is. A potential showdown with the Wildcats tomorrow night would make for an electric atmosphere in Kansas City. But there’s room for more than one rivalry, and if we’re in the business of anointing new conference feuds, we’ve got to think that Iowa State and Kansas will carry some bad blood into next year. For starters, there’s the sheer point differential of the two regular season games. The two teams needed overtime in both contests this season. First, in Lawrence, a miracle bank shot by Ben McLemore at the end of regulation helped the Jayhawks escape. In the rematch in Ames, an officiating controversy marred KU’s narrow win. That all led up to Round Three on Friday, and for much of the game, the intensity lived up to the hype. Kansas eventually ran away with the victory, but in the first half, you could tell this was more than just your run-of-the-mill semifinal between the top seed and five seed. Ben McLemore picked up a technical foul for jawing at Georges Niang on the bench after he knocked down a three-pointer, which then skyrocketed the tension in the arena. An irate Bill Self pranced up and down the sidelines, and minutes later, the officials then whistled his bench for a technical foul after they argued a no-call. Self seemed as fired up as ever. It seemed to spark his team after a competitive and highly entertaining first half. Defense and Rebounding: Iowa State’s inability to get a stop in the second half doomed the Cyclones. That’s not a new trend this season for Fred Hoiberg’s team. However, their poor effort on the boards was surprising. 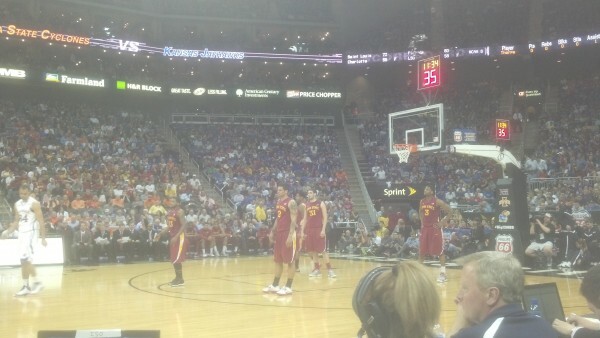 Kansas outrebounded ISU by 12, and at one point it grabbed five offensive rebounds on a single possession. Talk about demoralizing. In every way, the Jayhawks pulled away for the win by being the tougher team. It didn’t help that Iowa State’s shots weren’t falling from the perimeter, but Self had his team ready to punish the Cyclones in the second half. Surprise Star: Ten for 12 from the floor, 23 points. Not Ben McLemore, not Elijah Johnson, not Jeff Withey, not any of those guys. Those are the statistics of Perry Ellis, who overwhelmed defender Melvin Ejim and got into the paint with ease. Kansas’ guards tore up Iowa State with dribble penetration, and Ellis always seemed to be in the right spot for a wide open dunk or layup. He was nothing short of terrific in a career-high effort. Star of the Game: Let’s stay with Perry Ellis. There were times in the middle of Big 12 play when Self hardly let him see the floor. Ever since late February, though, the highly-touted freshman has become a new man. He’d been getting progressively better, and then he truly broke out today. And hey, the Jayhawk faithful began to chant “Perry, Perry, Perry!” in the second half. It was so surprising that it took a few seconds to realize what they were saying. Except more of those chants as Ellis’ career progresses. Sights and Sounds: Bill Self was in rare form. He was beside himself after that technical foul call on McLemore. He ranted and raved at the officials, drawing his own technical in a matter of minutes, but he must not have seen what McLemore actually did. Right after his three-pointer, it was immediately noticeable even to the naked eye that he turned around and made some sort of immature gesture to Georges Niang. John Higgins, the official who made the technical, told ESPN’s Fran Fraschilla at halftime that he did not hear what he said, but that he turned around and “got in his face.” Self may not have agreed, but Higgins appeared to have made the right call. Wildcard: Something’s wrong with Korie Lucious. After an 0-of-8 performance on Thursday and a late-game benching, he shot 2-of-10 from the field today and finished with five points. He had seven assists, yes, but he also shot 1-of-7 from three and appeared to be in a funk. Lucious is a critical part of this team going forward, so whether it’s the NCAA Tournament or NIT, the Cyclones need him to snap out of it. He’s more than capable of doing that, as are his teammates, who combined to shoot 9-of-34 from beyond the arc. What’s Next: Kansas advances to Saturday’s title game to face either Kansas State or Oklahoma State. This entry was posted on Friday, March 15th, 2013 at 8:10 pm by dnspewak	and is filed under 2013 conference tournaments, big 12, microsites. Tagged: big 12 tournament, bill self, fred hoiberg, iowa state, kansas, kansas state, korie lucious, will clyburn. You can follow any responses to this entry through the RSS 2.0 feed. You can leave a response, or trackback from your own site.